Gee, why wouldn’t they want to invite the people who filed a frivolous lawsuit against them or who have been trying to destroy them for over a year? I can’t imagine. In a departure from past state dinners, President Donald Trump is not inviting any Democrats or media to his first state dinner — which is sure to make for a far more relaxing evening. 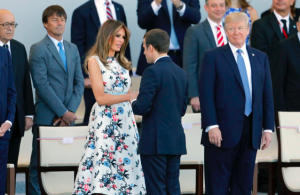 The president will host French President Emmanuel Macron next week and Trump is breaking tradition by not including Democrats or members of the press, according to Politico. House Speaker Paul Ryan, R-Wisc., Rep. Ed Royce, R-Calif., chairman of the House Foreign Affairs Committee; and Sens. John Kennedy, R-La., and Bill Cassidy, R-La. Senate Majority Leader Mitch McConnell, R-Ky., reportedly received an invitation, but could not attend.